Grind coffee one or 2 notches courser than French Press setting. Coffee to water ratio is different from hot brewing methods. You will use 1.66 lbs coffee to 1 gallon of water. This is same as 6.64 ounces of coffee to 1/4 gallon (one quart) of water. 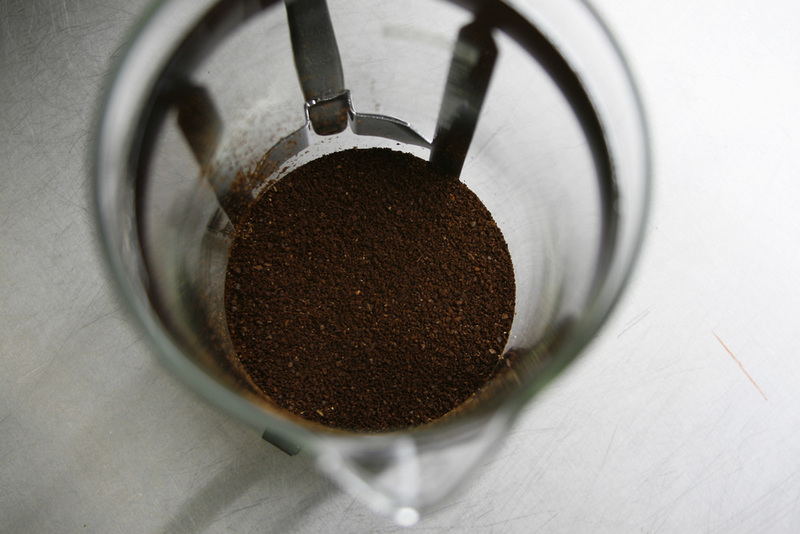 Grind coffee and mix with Room temperature water into Large French Press or beverage pitcher. Stir well and allow to sit for 12-18 hours. When you are ready to decant, spoon off grounds that have remained on top of brew and discard. Use a paper filter to keep grounds out of your brew. You can pour through a brew cone with paper filter or an auto-drip brew basket with paper filter. This is now a concentrate. When pouring a glass, mix with one part water and one part ice. Store concentrate in refrigerator for up to 2 weeks. There seems to be more methods to brew a pour-over than any other method. This may be because there are so many different shapes and materials of brew cones and paper and metal filters. Every little detail will result in a different method and final brew quality outcome. Some things remain consistent regardless of which cone and filter combo you use. Pre-heating the cone and rinsing the filter are mandatory. The style in which you pour the water over the grounds is crucial. You want to acheive a uniformity of extraction from each coffee particle and the size, shape, and material of cone and filter will require a specific jive from you in order to get a decent cup. Experiment and good luck! Incredibly simple and effective way to brew a cup of coffee (unless you'd like to make this complex. In which case, go online and into the rabbit hole of Aeropress brewing methods). Your grind setting will end up somewhere between "drip" and "fine". As always, you will need to trial different grind settings to determine which one is best. Start by inserting paper filter into unit and pouring heated water into press. this will pre-heat the press and your mug as well as rinse the paper filter. After all water drained out of press and you discarded water from mug, add 17 grams of grounds to press and tare scale with press resting on mug. Pour water over grounds slowly while rotating press to ensure complete and even saturation of grounds. Go slow! When you reach 277 grams on your scale, stop. remove from scale, place on counter top, and SLOWLY press down. Total time should be approximately 2.5 minutes. Auto Drip: Auto-drip is incredibly simple if you stick to the "common bits of info" list above. Keep in mind, you will need to do grind setting trials to find which setting is best for your drip brewing device. The most common issue with auto-drip brewing is the actual brewer is insufficient-unable to get the water to a proper brewing temperature or not capable of spraying the water over the entire bed of grounds consistently. There are only a few home auto-drip brewers available which actually work properly. Do an online search to learn more. Grind setting will be similar to "drip" (possibly a notch courser). Grind 42 grams of beans. 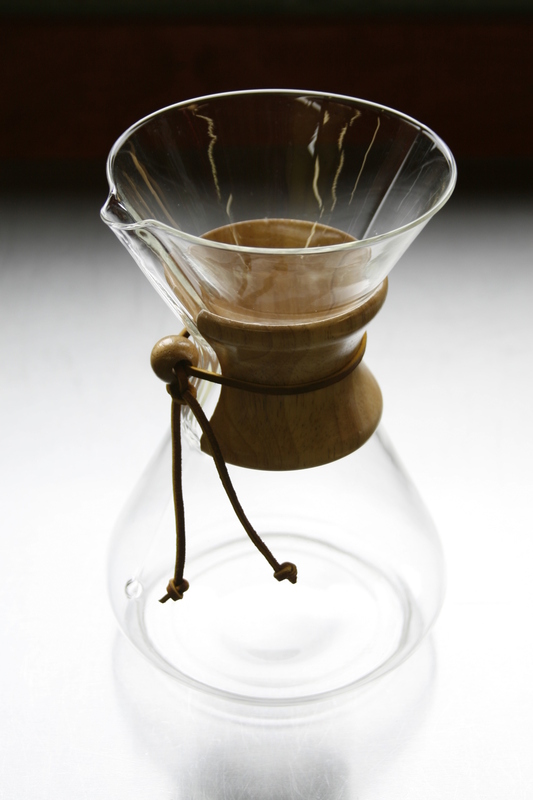 The special Chemex paper filters, when folded, will have one side that has 3 layers of paper. This side should cover the pour spout. Place filter in position and rinse well with heated water. Slowly pour this rinse water out of spout and begin brewing. Start timer for 4 minutes. Pour 150 grams of water evenly over grounds and lightly swirl once, ensuring full saturation of grounds. Allow to bloom and rest for approximately 40 seconds. Pour an additional 200 grams of water evenly over bed of grounds and rest. At 2 minutes, continue pouring remaining 350 grams of water only in the middle of the coffee bed, in a circle the size of a quarter. Your goal is a four minute brew time. You will need to experiment with the frequency in which you add water to the grounds. If pouring at the correct rate you will see the grounds in suspension for the entire brew cycle and will never see a pool of water over the grounds or dry grounds. You should not see any blonde spots or dark spots in your coffee bed, but rather an even color throughout the brew cycle. As always, you will need to discover which grind setting to use. If brew cycle is complete prior to 4 minutes, go finer on the grind to slow the total time down. If brew time is longer than 4 minutes, go courser on the grind. Grind setting is NOT the "course" setting on grinder. Rather, half way between this setting and the "Drip" setting is where you should be. Depending on which grind setting you use, you will keep water in contact with grounds for a total time of between 4 and 6 minutes. You will need to determine what the contact time should be based on how the brew tastes. If the coffee is weak or watery, you will need to increase the contact time. If the coffee is too strong or bitter, you will need to decrease contact time. So, start with a 5 minute contact time and go from there. The simplest and most effective way to brew using a press pot is to first pre-heat the pot and plunger with hot water. Discard after pot is very hot. Start the timer as you pour the first bit of water over grounds. fill pot 1/3 full and swirl well to ensure all grounds are thoroughly wet. As timer reaches 40 seconds, slowly continue to fill pot while swirling (this swirling will knock down the foam/bloom that builds up). Do not fill any higher than the bottom of the pour spout on pot. Gently rest the plunger in the pot (so the screen of plunger is not making contat with grounds). SLOWLY press but do not force the plunger down onto bed of grounds as you near the bottom. Serve the coffee promptly.